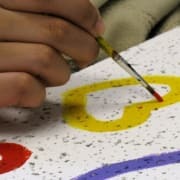 Arts in Healing volunteers currently offer opportunities Tuesdays - Fridays in visual arts, creative writing, dance/movement, music and jewelry making. The Arts in Healing Program at Sacred Heart Children’s Hospital utilizes the creative arts to help pediatric patients and their family members express emotions and cultivate coping skills in regard to illness and hospitalization. Research indicates that creative self-expression--whether in the form of music, visual art, drama, writing or movement--helps reduce stress and anxiety, lowers blood pressure, minimizes the need for pain medications and promotes overall well-being. Background and strong interest in the Arts. Experience working with children.